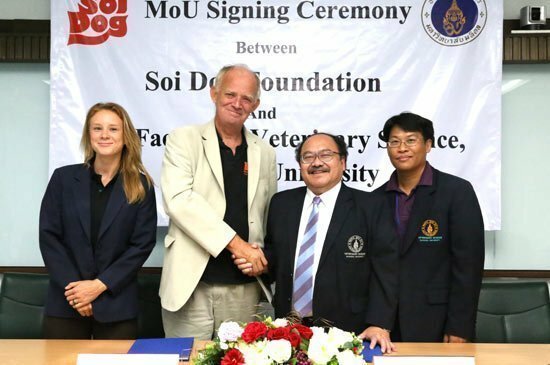 Soi Dog Foundation signs memorandum of understanding with Mahidol University. Organisations To Collaborate On Animal Shelter Medicine Elective Module. Phuket – 13th May 2015 – Soi Dog Foundation, Thailand’s leading dog and cat welfare charity, recently announced the signing of a Memorandum of Understanding (MoU) with Mahidol University’s Faculty of Veterinary Medicine to jointly develop an animal shelter medicine elective module for final year veterinary students of the prestigious Bangkok-based University. The actual module will be taught at Soi Dog Foundation’s Phuket-based dog and cat shelter, and will be a combination of both theory and practice. Shelter medicine is now widely taught at Western veterinary schools, and is a discipline in its own right. This will be the first course of its kind in Thailand. Dr Katherine Polak, Director of Animal Welfare at Soi Dog and a shelter medicine specialist, will be working with the education department at Mahidol University to plan the course. Dr Katherine said: “We’re really excited to be working with Mahidol University on this new project. Animal shelter medical practice differs significantly from other forms of practice, but is not usually taught in South East Asian veterinary schools. We want to share our practical experiences and skills with the students, and develop their understanding and competencies in this area.”. The three week elective rotation for final year veterinary students will accommodate up to 10 students at a time, and will commence in spring 2016 at Soi Dog’s shelter in Phuket. The collaboration will also extend to the development of a veterinary faculty training programme in which selected faculty members will be trained in animal shelter medicine topics, to allow them to initiate their own shelter courses. Finally, the Shelter Medicine programme will start with a two day training workshop to be held at Mahidol University on May 19th and 20th 2015, which coincides with the World Small Animal Veterinary Association (WSAVA) conference in Bangkok. The workshop is designed for Thai veterinarians who work in shelters, university professors and WSAVA delegates. John Dalley, co-founder and vice president of Soi Dog added: “This is a very positive development, and comes just after the passing of Thailand’s first animal welfare law. We’re really pleased that Thailand is leading the way in animal welfare in this part of the world, and we look forward to more collaborations with Mahidol University in the future”.